Home / Local / Showbiz / Trending / Ganito Pala Tratuhin ni Pokwang ang Kaniyang mga Kasambahay, Ibang-iba Talaga Siya! Ganito Pala Tratuhin ni Pokwang ang Kaniyang mga Kasambahay, Ibang-iba Talaga Siya! Everyone in the Philippines know Pokwang as someone who is always smiling and happy. Her friends also swear that she is very humble. Apparently, this is the kind of attitude she shows at home, when she is among their house helpers. You can watch it all in this video. It starts with Pokwang starting the day in their garden, to check up on the house helpers who were obviously up earlier than her to tend to the plants, clean up the yard, and do other kinds of housekeeping. So naturally, Pokwang approached them and asked them how they were, and what was up. What happened next, though, was the most unbelievable part. "Okay naman po, pero mas okay magluto ka na kasi gutom na kami." Can you imagine a house help talking to her employer like that? Most people would have thrown a fit at an answer like that, but not Pokwang. 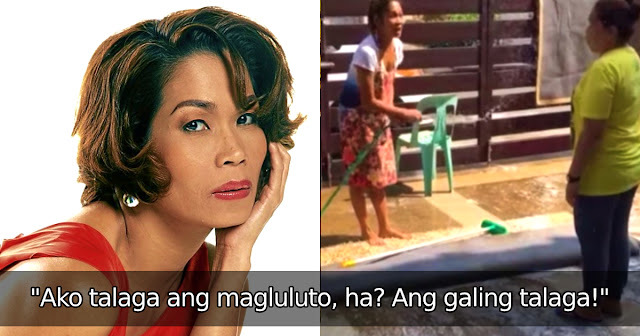 "Hindi pa po, Ma'am, sorry po, Ma'am," before spraying the poor woman with water from the hose! It's really nice to see such a successful person turn out to be humble and well-mannered. It must be really nice to work with an employer like Pokwang if she is always in this kind of mood! What can you say about this? Did you expect Pokwang to be like this towards her employees? Let us know in the comments section below!